Isaac Asimov has garnered many such accolades for his celebrated science writing. In Out of the Everywhere, Doubleday’s twenty-fifth collection of Asimov’s science essays, the Good Doctor once again expounds knowledgeably and skillfully on the seemingly arcane world of scientific phenomena. Divided into six sections—Astronomy, Humanity, Radiation, Magnetism, Fuel, and Time—this volume includes seventeen compelling ruminations on the wonders of science, and tackles issues such as the formation of the solar system, energy, evolution, population control, and the deterioration of our environment. Each of the interconnected scenarios reveals the structural harmony of our universe and the crucial role of humanity in this grand orchestration. 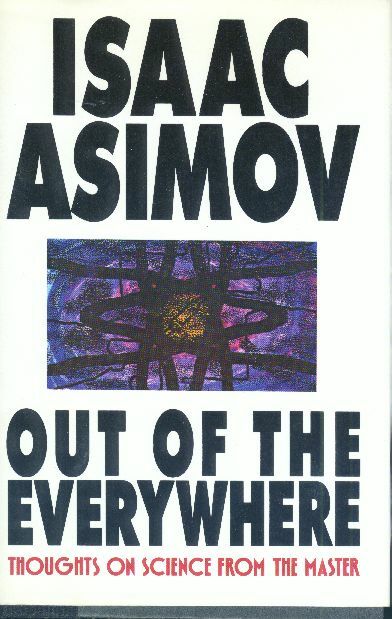 Always current and accurate, Asimov’s familiar tone illuminates the vital relevance of his chosen topics to our everyday lives, encouraging his readers to learn more about the world around them. So while there is nothing in here that I actually dislike or even come close to not enjoying—my enthusiasm is ever-so-slightly marred by this volume’s unfortunate failure to be quite as fantastic as its siblings. And if that’s not praising with faint damns, I’m not sure what is.